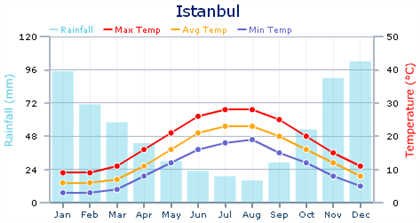 Istanbul has four distinct seasons. Winters are cold and rainy, and in some years it snows frequently. The snow can sometimes be heavy enough to justify schools being closed. Spring can be very wet, but it also brings a riot of colour as many flowers, particularly tulips, bloom throughout Istanbul. Summers can be hot and humid, and an air conditioner is very useful. Autumns are mild.